California Dyslexia Bill A.B. 1369 Advances to the Governor Brown! CA Residents – Email Him! California Senate unanimously passed A.B. 1369 which states that the Superintendent shall: “develop program guidelines for dyslexia to be used to assist regular education teachers, special education teachers, and parents to identify and assess pupils with dyslexia, and to plan, provide, evaluate, and improve educational services to pupils with dyslexia.” See the entire bill at the link above. Governor Brown must now sign it into law. To email Gov. Brown of California click HERE. You can also call Governor Brown’s Office during the week here: Phone: (916) 445-2841. Tell him that you believe dyslexia is important and that the new dyslexia law (A.B. 1369) should be signed by him. Usually there will be a staffer who will take down your information – and later report to him how many people called support and how many oppose. 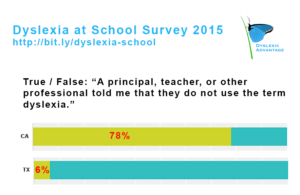 “True or False: A principal, teacher, or other professional at my student’s school told me that they do not use the term dyslexia.” A whopping 78% of California parents said that an authority at their school didn’t use the term dyslexia! If you haven’t taken the survey and you are a parent of a student with dyslexia, take it now here: Dyslexia at School Survey. Share the link too. It’s really making a difference! We’ll report on more important findings as we’re able. Thank you so much! Dyslexia-Specific laws are an important first step for teachers, schools, and districts to start recognizing the educational needs of dyslexic students. 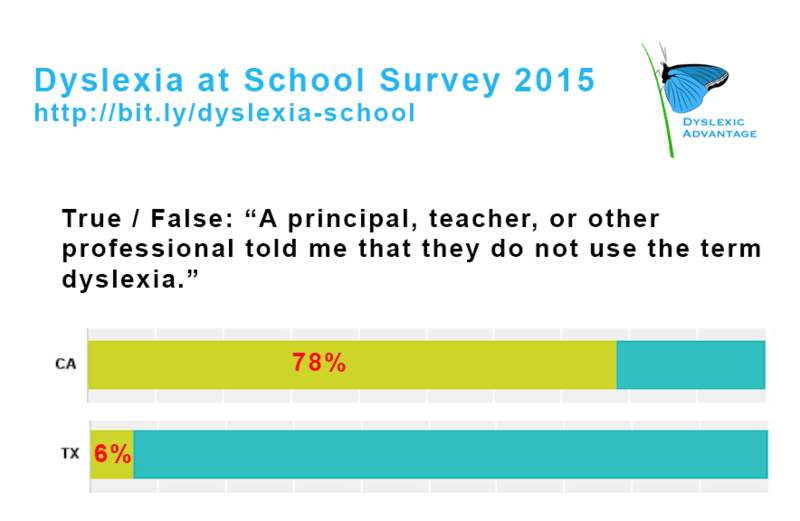 From our over 2300 respondents to our Dyslexia at School Survey (still open), there are dramatic differences in school practice and policy. For instance, where as 78% of the parents of dyslexic students in California have heard that “a principal, teacher, or other professional told me that they do not use the term ‘dyslexia'”, only 6% of parents in Texas agreed with the same. A key difference is that Texas had its first Dyslexia law in 1985 (and subsequent laws and policies passed). One of the leaders of the Bipartisan Dyslexia Caucus is Representative Lamar Smith. The Caucus recently wrote to Asst Secretary Yudin to ask that the Department of Education clarify to state education departments and districts that the term ‘dyslexia’ should be used in the public school system. As the Bipartisan Caucus on Dyslexia points out – dyslexia should be recognized at ALL schools in the US as it is specifically mentioned under the IDEA 2004. It is important to recognize dyslexia as there are specific educational challenges and strategies to remediate and support involving areas such as reading, writing, processing speed, as well as often specific aspects of memory, executive function, and math. Dyslexia is also associated with strengths, and we firmly believe that an appropriate education for students must consider children’s strengths and intellectual ability. Why is Texas so ahead of other states? Texas’ first dyslexia law was passed in 1985! Representative Lamar Smith from San Antonio is currently one of the leaders of the Bipartisan Dyslexia Caucus. Representative Julia Brownley from California is co-chair. Thank you Dyslexic Advantage Action Team, Decoding Dyslexia California, and Literate Nation! Yes, Texas will use the term…however, they greatly resist using it in an IEP. In fact the state encourages Dyslexia services in a 504 plan and makes it very difficult to have a child identified with dyslexia and get an IEP in place. It does make a difference and this should be pointed out. You can talk about dyslexia all day long in Texas but bring it up along with IDEA and they go as silent as any other state. Why? Well 504 attaches many less legal protections for parents including private placement awards. Additionally, 504 services are not determined the same way as with an IEP team, where the parent is an equal partner in the determining appropriate services.